Mission Housing Development Corporation (MHDC), under contract with the San Francisco Housing Authority, redeveloped the Valencia Gardens site located on Valencia Street, San Francisco, California. The redevelopment included demolishing the existing building complex and constructing 290 residential units and community spaces. Prior to founding AEW, Dr. Leung was the project manager for geotechnical and environmental investigations at the site. The objectives of the project were to collect site geotechnical and environmental data for geotechnical engineering analyses and evaluation of the subsurface environmental conditions at the site. After founding AEW, the firm was retained by MHDC to assist with the site closure and to provide environmental construction support and oversight during site demolition and construction phases. As part of site closure support, AEW worked with MHDC’s environmental attorney to identify potential site closure strategies. We prepared a supplemental environmental report summarizing the potential risk to humans and the environment from the chemicals detected in soil and groundwater, developed a soil management plan, and prepared a supplemental Phase II environmental site assessment. The supplemental report recommended site closure with no further action and implementation of the soil management plan to manage and reuse the excavated soil at the site during construction. MHDC’s architectural design team estimated that over 40,000 cubic yards of site soil would be excavated during site grading for the new building construction. Working with the architectural design team, AEW developed the soil management plan to maximize the reuse of excavated soil at the site with a savings of multi-millions of dollars in disposal cost. The supplemental environmental report and soil management plan were approved by SFDPH within one week of submittal. The environmental documents including Phase I environmental site assessment report were also prepared to address potential environmental concerns from financial institutions that financed the redevelopment project. During site construction, AEW assisted MHDC in addressing any environmental issues encountered, overseeing the soil management plan implementation by the construction contractor, and provided liaison support with SFDPH during site construction. 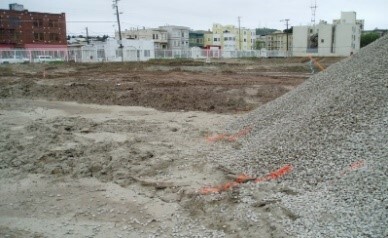 Upon completion of the site construction, AEW prepared a site closure report summarizing the soil management activities performed at the site and assisted in preparation of the deed restriction for signature between San Francisco Redevelopment Agency and SFDPH.